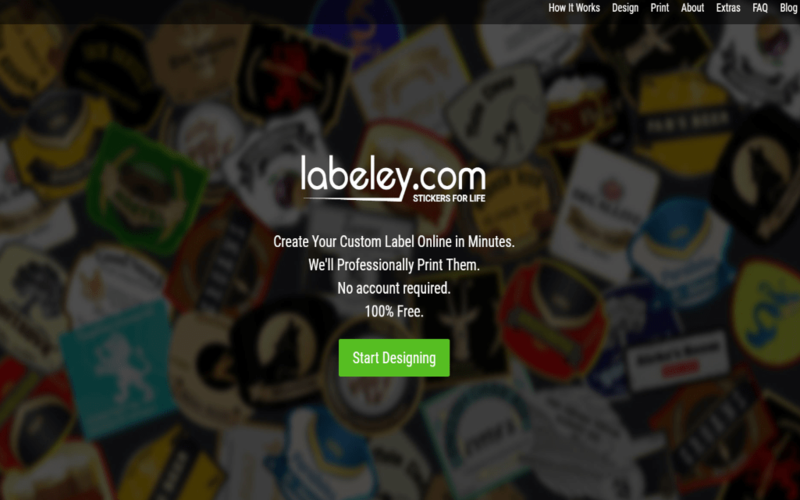 Labeley is an online software for designing labels for kids, drink bottles and glasses, homemade products, and all sorts of events: birthdays, business parties, anniversaries, weddings and even family holiday celebrations. Therefore, it comes handy to a number of people: from busy parents trying to organize their kids stuff and keep them from losing to wine and beer brewers and event organizers. 1) It is a completely free app for designing labels and stickers. There is no catch here: you can design any number of labels, anytime and anywhere (as long as you have a computer and Internet connection, of course). To make the design process easier, the tool is organized into five different label categories: general, kids, beer, wine and holiday labels. Each comes with a different set of shapes, borders, backgrounds, graphics, font and text options, and other label elements. Additionally, wine and beer label makers offer a specific group of shapes for creating bottlenecks. It is important to note that all these elements are completely free to use in your designs. There is no additional or hidden cost there. You can combine all the ready-made designs to create your own custom label. 2) It does not require any personal information. Definitely one of the best things about Labeley is that to design, save and download labels you don’t need to provide your email address or any other contact and personal information. Just visit the tool’s website, choose the type of label you want to create, for example, wine label, then make your custom design and download it to your computer to print out or use in your digital documents, presentations, brochures, or anywhere else. Once again, you can create as many designs as you want. 3) Everyone can create labels without any design skills. Most parents who are among the biggest consumers of stickers for all sorts of kids stuff (textbooks, notebooks, pencils, erasers, clothes, shoes, camping, sports gear…) generally don’t have any design knowledge or experience. The same goes for small, craft beer and wine producers and other small business owners, and party and event organizers. Labeley is designed with all of them in mind: it offers a selection of some 50 different label shapes plus myriad of other label elements including graphics designed by professional designers that only need to be combined into a custom label for almost anything. 4) Design absolutely unique stickers for your needs. As great as it is to have at your disposal numerous ready-made shapes, borders, background patterns and illustrations that you can use to make a personalized label, sometimes you may want to personalize it a bit more with your own photos and images to make in not only unique, but personal. For example, for an engagement party or a wedding celebration, you may want to customize your champagne and wine bottles with a photo of a happy couple, right? Labeley offers this feature (look for Upload icon in the left vertical sidebar, click it and choose any photo or image from your computer). It may be worth mentioning that you are not limited to only one image per label, you can upload multiple and use them in your design. 5) Save and modify stickers anytime in the future. Labeley allows its users who decide to register their free use account to store their designs in their personal libraries and access them for easy editing and repurposing. For example, you may want to be able to change personal details on a sticker like the name or the grade of a kid, so you don’t have to design multiple labels for all your kids.